Owners of Chateau Montrose, brothers Martin and Olivier Bouygues, come in at number 12 on France’s rich list with 3.7 billion dollars. This is a very good thing as the Estate has released their 2014 this morning for £850 per case of six bottles, an aspiring 25% higher than the 2013 and 2012, ex-London. What is more spectacular is that today’s price ex-negociant is 34% higher than last year. Unless you want a case of Montrose 2014 bottled in a large format, there is absolutely no reason to buy it today, it will be cheaper in 20 months once it is bottled. So what has caused Chateau Montrose to ignore everything the market is saying? This is a re-positioning exercise, aimed at bringing Montrose in line with Cos d’ Estournel (£825 in 2014). The reason they have chosen the 2014 vintage is firstly the very favourable FX rate, but more importantly the very high scores Montrose received, with 95-97 from the Wine Advocate and 94-97 from the Wine Spectator. This re-positioning however makes physical vintages under £600 look very compelling indeed. We can confidently say that the 2014 vintage won’t be selling out and the Chateau will retain a lot of stock. However, this means that with this line drawn in the sand, Montrose lovers won’t be able to buy new vintages below £800 going forward. 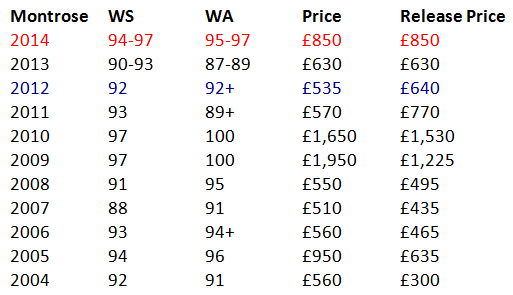 Montrose, over the coming years, will force the price of their vintages up, any older vintages released from the chateau (ex-Chateau) will be more in line with today’s release price, causing a long-term shortage of physical vintages at under £600. This morning we have also been enquiring in Bordeaux into prices for the remaining vintages that trade in London for under £600, the 2012, 2011, 2008, 2007 and 2004. What is now clear is that the Place de Bordeaux will struggle in the coming years to supply markets with stock to be sold under £675. This makes the 2012 vintage, which was originally released at £640 but now trading at £545, look very compelling. We have managed to secure a parcel of the 2012 at lowest UK market price of £535 per case of 12 bottles. The 2012 vintage is charming and Robert Parker says that 2012 Montrose ‘stands out as one of the highlights of 2012′. Parker scored Montrose 2012 92-94 from barrel and then 92+ from bottle, ‘This wine will need bottle age because of the tannin profile, should hit its prime in another 7-8 years, and last for another 20-25. This is another wine with the alcohol pushing an impressive 14% and a finished pH of 3.7 – two characteristics of a very ripe, high-quality vintage.’ As such it promises a higher re-score from Parker and Neal Martin in the future. Moreover, the Wine Enthusiast, Jean-Marc Qurain and Tim Atkin all give the 2012 95 points, rating it above the 2008. At £44.50 per bottle the 2012 is undervalued and a Montrose to own, for price appreciation and future drinking. Montrose’s new pricing mechanism makes this the perfect time to back-fill on Montrose 2012. This is fabulous young red with blackberries, currants and wet earth. Full body, firm tannins. Very long finish. It really takes off. As sleek and tightly coiled as they come, with wonderful purity and cut to the red and black currant and red and black cherry fruit. The long iron spine is thoroughly embedded and a gorgeous echo of charcoal lingers at the very end of the lightly pebbly finish. Everything finally seems to be coming together here. The 2012 Montrose (57% Cabernet Sauvignon and 37% Merlot), is rich, broad, and dense ruby/purple, with substantial tannins still to shed. It is a rather masculine, medium to full-bodied Montrose, with cassis, crushed rock and spice. This wine will need bottle age because of the tannin profile, should hit its prime in another 7-8 years, and last for another 20-25. This is another wine with the alcohol pushing an impressive 14% and a finished pH of 3.7 – two characteristics of a very ripe, high-quality vintage.